Should Isaac have been pinged? 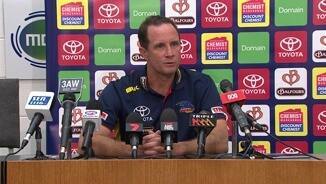 Watch Adelaide's press conference after round five's match against Hawthorn. Paul Puopolo's scoreboard impact is up to 43 points, a careerhigh. His previous high was 35 points against the Power in round 20, 2012. Make that 10 disposals in the forward 50 for Paul Puopolo and three score assists. No other player has won more than seven disposals in this zone. Paul Puopolo has won a gamehigh nine disposals in the forward 50 as well as booting four goals and assisting two scores. The Crows have won 23 more possessions, including seven more contested possessions, than the Hawks in the last 10 minutes. Jack Gunston scores a behind at one end and Paul Seedsman boots a goal at the other from the kickin. That was the Crows' first score from this source tonight. They scored nine points per game from this source in the first four rounds, ranked second. Paul Puopolo is up to five disposals this quarter as well one goal and one goal assist. That goal to Tom Lynch was the first for the Crows launched from a chain originating in the forward 50. The Hawks have launched 20 points from this zone. Adelaide is yet to launch a score from the forward 50. It launched 22 points per game from this zone in the first four rounds, the fourthmost in the AFL. Tom Lynch was the standout player in the third quarter. He won a quarterhigh 11 disposals and grabbed a quarter-high four marks as well as being involved in five of his team's seven scores. 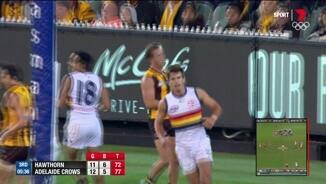 The Crows won nine more groundballgets than the Hawks in the third quarter and despite winning three fewer clearances, generated three scores to none from this source. That goal to Isaac Smith was launched from a turnover won in the defensive 50, the Hawks first from this source in this game. The Hawks have scored just seven points per game from this source this year, the thirdfewest in the league. After a quiet first half, Tom Lynch has won a quarterhigh nine disposals as well as being involved in four of Adelaide's five scores. Both of Adelaide's goals this quarter have been sourced from intercept possessions won in the attacking midfield. That goal to Jarryd Lyons was the first for the Crows sourced from just six turnovers in the forward half. The AFL average is 31 points from 24 turnovers in this zone. The Hawks and Crows have combined to record just 10 effective kicks this quarter. Crows InterchangeJake Lever off due to an injury. The Hawks have scored 14 points from seven turnovers created in the forward 50. The Crows are yet to create a turnover in the forward 50. Just six of Adelaide's 61 possession chains have originated in the forward half and it has scored 12 points from them, whereas 21 of Hawthorn's 62 possession chains have originated in the forward half and it has scored 28 points from them. Rory Atkins won a quarterhigh eight contested possessions and a team-high 11 disposals in the second quarter as well as being involved in an equal quarter-high four score involvements. Hawthorn won the clearance count by nine that quarter but both teams generated three scores from this source. That goal to Josh Jenkins was launched from an intercept possession won in the defensive midfield.The Crows have launched just the one goal from a chain originating in the forward half. Cyril Rioli is up to six disposals this quarter as well as kicking three scores. That intercept mark to Jake Lever was just the third of its type for the game. There had been 14 per game in the first four rounds. Josh Jenkins has been well held by James Frawley. That was Jenkins' first disposal for the game. Paul Puopolo is up to seven disposals this quarter as well as being involved in three of his team's four scores. Hawthorn has recorded 10 of the last 11 inside 50s and outscored Adelaide 210 during this period. Rory Sloane was a standout for the Crows. He won a quarterhigh nine contested possessions, five first possessions and four intercept possessions, and launched a quarter-high three scores for his team. Adelaide won the ball at the contest in the first quarter. It won the groundballget count by nine and the clearance count by six, outscoring Hawthorn by 23 points from this source. That clearance to Cyril Rioli ended a run of seven consecutive clearances for the Crows. Adelaide lead the clearance count 137 and have outscored Hawthorn by 24 points from this source. 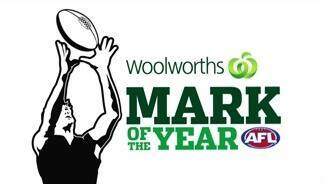 The Crows lead the centre clearance count 43 and they have outscored the Hawks 12-0 from this source. The Crows have launched 24 points per game from the defensive midfield this season, the thirdmost in the league. They have launched 18 points from this zone tonight. The Crows have now scored four goals from clearances. That mark to Taylor Walker was the first inside 50 for the game. Adelaide has grabbed just 10 marks inside 50 this season, the thirdfewest of all teams. The Crows have won five clearances and launched a goal from three of them. There has been just two turnovers to start this game, both in the defensive half and both launching scores. Hawthorn's second goal was launched from a kickin. It has scored five points per game from kick-ins this season, ranked ninth. Hawthorn launches its first goal of the game from a clearance. It has scored 27 points per game from clearances this season, the fifthfewest in the league. Adelaide launch the first goal of the game from a clearance. It has scored 41 points per game from clearances this season, the fourthmost in the competition. Adelaide has scored 31 points per game from chains originating in the defensive 50 this season, ranked No.1 in the competition. Hawthorn has launched just 10 per cent of its scores from centre bounce clearances this season, the secondlowest percentage of any side. Welcome to MCG for the Hawthorn v Adelaide Crows Round 5 clash. PAUL Puopolo has inspired Hawthorn to a remarkable comeback victory over Adelaide, the small forward's fifth goal in the dying seconds securing a thrilling three-point win for the reigning premier at the MCG on Friday night. 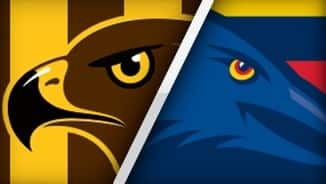 The Hawks trailed by 15 points at the 18-minute of the final term when Crow Luke Brown goaled from outside 50m, but they kicked the final three goals of the game – two from Puopolo – to pinch a 17.10 (112) to 17.7 (109) win. 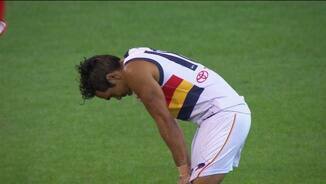 Puopolo's match-winner came when he received a free kick after Crows defender Brodie Smith fell on to his back. Taking his set shot from 40m, Puopolo split the middle and the Hawks had to negotiate just 18 more seconds for victory. The Crows made it a nervous finish, pumping the ball deep into their forward line from the final centre bounce, but the Hawks weathered the storm and the four points were theirs in Shaun Burgoyne's 300th game. Puopolo was outstanding all night, finishing with 23 possessions, six tackles, five clearances and three score assists. Cyril Rioli was an able partner-in-crime for Puopolo in attack, finishing with four goals, including one at the 23-minute mark of the final term that dragged the Hawks to within three points. The Crows worked overtime to deny Sam Mitchell the time and space he's been afforded so often this season, but the midfield star was still a prolific ball-winner for the Hawks with 31 possessions. Captain Luke Hodge was a steadying influence in what was a frantic contest, while Isaac Smith's run was also important. 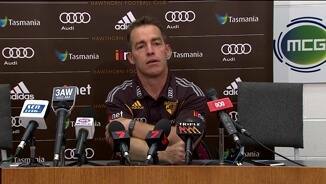 Hawthorn coach Alastair Clarkson conceded after the match that his team had been fortunate to win. "We were perhaps lucky they didn't put more scoreboard pressure on us in the third quarter and we still found ourselves within striking distance in the last quarter," Clarkson said. "They were really good again for big chunks of the last quarter, and somehow we just found a way by special plays at really, really critical times." It was Hawthorn’s seventh consecutive win over the Crows, but the visitors lost no friends after what was a high-class contest. Adelaide coach Don Pyke said he was disappointed to lose but "really proud" of his players' effort. "We came here with a clear intent, which was to get the four points. We fell short which is disappointing, but as they say there's a fine line between pleasure and pain isn't there," Pyke said. Pyke did not notice his team make any glaring structural errors in the final seven minutes of the game after Brown kicked the Crows' last goal. "Seven minutes is still a lot of time in the game and we felt from a coaching viewpoint that we probably understood, with Hawthorn and the quality of their side, that they would keep coming," Pyke said. "For us it was just about our ability to execute at the end of the game. Some of our skill (errors) created some opportunities for them." Rory Sloane was inspiring for Adelaide, imposing himself on the contest at stoppages and in the open. Twelve of his 26 possessions were won in the first quarter when the Crows got off to a flying start and signalled they were up for the fight. Scott Thompson continued his outstanding early-season form, racking up a game-high 33 possessions in the midfield, while Rory Atkins (27 possessions) and David Mackay (23) were damaging in open space for the Crows. Tom Lynch was a tireless worker in attack and hurt the Hawks with two second-half goals, while Eddie Betts kicked three first-quarter majors – he had kicked just two goals in three previous games for Adelaide against Hawthorn – but faded from the game thereafter. 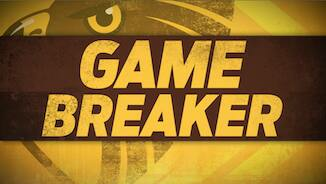 The Crows hit the Hawks hard from the first siren. After an even opening to the game that had Hawthorn six points up at the 12-minute mark, the Crows slammed on the next five goals to jump out to a 24-point lead. 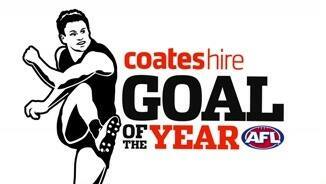 Significantly, it was Betts who did most of the damage, kicking three goals for the term. Adelaide's early lead was built on its dominance at clearances (15-9) and contested possession (47-38), but a late goal to Tim O'Brien helped the Hawks claw to within 16 points at the first break. Gunston conjured a remarkable goal earlier in the term, when he tapped the ball in front of himself near the boundary line with Crows defender Jake Lever on his hammer. Gunston's momentum carried him across the boundary line, but he kept the ball in play – somehow – as he ran behind the point post before darting back into play to ram a goal through from point-blank range. 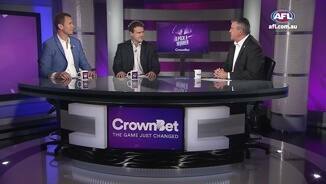 As it has done so often in recent years, the reigning premier hit back quickly and fiercely. Seizing control around the stoppages – they won the clearances 17-8 in the second term – the Hawks rammed on six goals to the Crows' three to go into the main break two points up. Rioli was electrifying in this period, soccering a brilliant left-foot snap for the term's first goal and adding a second – his third for the half – after flying for a pack mark midway through the quarter. The Crows then counter-punched with a four-goal-to-two third term to set up a tantalising final quarter. Hawthorn: Brad Hill came from the ground with the assistance of two trainers late in the first term after appearing to injure his left knee when he collected Crow Paul Seedsman's leg following through on a kick. Hill went into the rooms to be assessed, but came back on to the ground early in the second quarter and played out the rest of the game with his left knee strapped. "I haven't spoken to the docs but I think it will just be some kind of cork and he was able to continue to play," Hawks coach Alastair Clarkson said of Hill's injury after the game. "He'll be a bit sore tomorrow probably, but he will get himself right and hopefully be OK for GWS next week". Sam Mitchell also came from the ground early in the second quarter after being crunched in a heavy tackle, but after getting some treatment on his back returned to the ground soon after and finished as one of the Hawks' best players. Adelaide: The Crows emerged with a clean bill of health. Hawthorn plays Greater Western Sydney next Saturday at Spotless Stadium, where it suffered its first loss against the Giants in round six last year. Adelaide will be looking to overcome a four-game losing streak against Fremantle when it hosts the Dockers at Adelaide Oval next Saturday.